We’re really enjoying the third season of Queer Eye here at The Takeout. We’re in your corner, Jess! Be kind to yourself, Robert! We want to buy an album from the Elrod Family Band! We tried tomato juice mixed with lemonade! You get the idea. But of all the wonderful stories found within the most recent adventures of the Fab Five, that of the Jones sisters and their barbecue joint is the one that most stole our hearts. It would appear we’re not alone there—Jones Bar-B-Q sold roughly 1.7 bottles of its branded barbecue sauce per minute over the weekend. As Refinery29 points out, that’s more than $76,000 in sales. 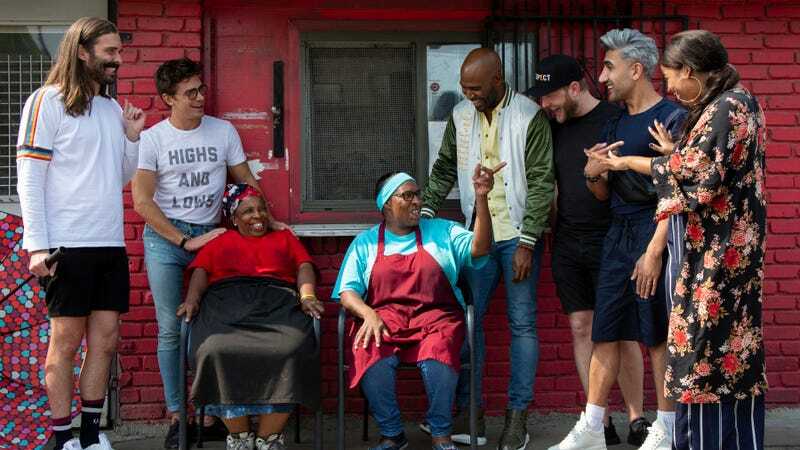 For those who haven’t yet watched “Jones Bar-B-Q,” the excellent second episode of Queer Eye’s third season, here are the basics. The Jones sisters—Shorty and Little—run one of Kansas City’s best barbecue places, but had little time to take care of themselves or work toward further growing their business . Enter the QE guys. We won’t spoil much of what happens in the episode, because you should watch it, but one of the major items on the to-do list involves bringing in a chef and a food scientist at a bottling company to help Little and Shorty bottle their family-recipe sauce. It’s a step that proved difficult for them to take—those family secrets are tightly-held—but one that, once taken, seemed likely to make the work days much simpler, and which had the potential to take Jones Bar-B-Q to the next level. All without having to tell Antoni what secret ingredients make the sauce special. In most, but not all, cases, it’s Bobby Berk who achieves the most for the heroes, dramatically transforming living spaces in ways both practical and personal in very little time. To be fair, he does basically give Shorty and Little a whole new restaurant, including a welcoming patio and (more importantly) a more efficient and comfortable kitchen. But this sauce development is no small thing. It’s potentially business- and life-changing for these two hardworking women. The season’s best episode was already heart-warming; this news is the delicious cherry—or sauce—on top. There’s only one thing about this that’s not totally wonderful: We’ll have to be patient before we can give the sauce a try. Find out more about the Jones sisters and the rest of the season three “heroes” in this trailer.